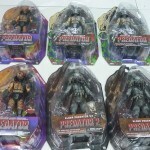 Check out some new photos of NECA’s Viper Predator 7″ Scale Figure from their upcoming Predator Series 12. Along with the Viper Predator, series 12 will include the Enforcer Predator and the Elder Predator. Unlike previous releases, the Viper Predator is an all new design created by NECA! The figure is the official pilot for their upcoming Blade Fighter Vehicle, and will include blade gauntlets on both forearms, a removable mask, and 2 sets of interchangeable hands. The Viper Predator and series 12 hits stores later this month. You can see the photos by reading on. Also hitting shelves soon the stand-alone Bad Blood Predator. Check out the preview pic after the jump.